There are a number of plastic bonding technologies and Carville’s primary method is based on diffusion bonding which we have been pioneering since the 1960’s, starting with aerospace instrument panels for military and commercial applications including the famous Concorde aircraft. Carville have now supplied over 1.5Million bonded manifolds globally. The diffusion bonding process enables plastic materials to be joined at a molecular level to create a “pure” bond or weld without the use of any adhesives, mainly by using a combination of heat, pressure and time. 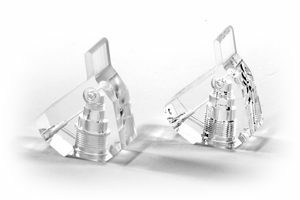 This has a major advantage over adhesive solutions as these are often seen as contaminants, especially when using the methods to produce manifolds for sensitive applications such as medical devices or In Vitro Diagnostics (IVD) applications. Adhesive joining is also less consistent and can often bleed into the channels and tracks, as well has creating some dead areas where there is no adhesive and inherent weakness. Another significant advantage of diffusion bonding is that the mechanical and thermal properties of the bonded product can be very close to an equivalent solid block of the plastic. Future thermal expansion or contraction will not have a detrimental effect, and torsional and tensile strength can be over 96% of the equivalent parent material. 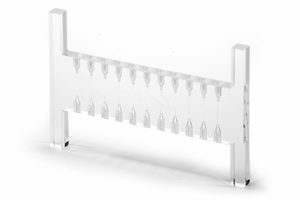 For transparent materials such as Acrylic / Perspex / Plexiglas / Lucite (PMMA), it can create a fully transparent join to allow for visual inspection of fluid samples in the channels or integration with optical sensors. Carville continuously developed the diffusion bonding process, producing the world’s first bonded plastic manifold for a medical application (haematology) in the 1980’s. Carville developed the HADB process as an innovative extension of the diffusion bonding process over a number of years. First used commercially in 2009, it provides very accurate feature alignment and channel integrity with a very strong bond over multiple layers. 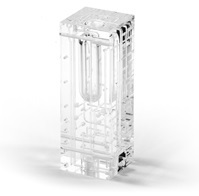 HADB is ideal for multi-layer plastic fluidic manifolds, allowing complex 3 dimensional fluid channels. It is increasingly being used to replace traditional cross-drilled manifolds due to the massive design flexibility and freedom away from the restrictions of drilling access, plugging holes and valve positioning. 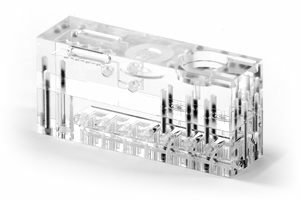 Carville now manufacture and supply many thousands of HADB manifolds and microfluidic systems to clients in Europe, Asia and the USA. Carville continue to innovate in plastic bonding techniques with various materials, encapsulations and other technologies, so if you have a challenging product development requirement, contact Carville at sales@carville.co.uk to discuss your project.